Department, Indian Navy has issued official notification regarding the Indian Navy Trade Mate Recruitment 2019. The recruitment is for the posts of Trademark (Indian Naval Civil Entrance Examination), in which there are a total of 554 posts. Indian Navy has set a written examination for the declared posts. Candidates must pass the exam to get this job. All information regarding the Indian Navy Tradesman Recruitment 2019 is available on the official website ie www.joinindiannavy.gov.in. Candidates can visit the official website to know all those requirements. 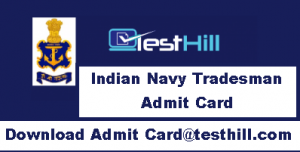 All participants applying for Indian Naval Trades employment recruitment will have to take the Indian Navy Tradesman Admit Card 2019 on the day of the examination which is scheduled on 14th April 2019. Candidates will be able to download their Indian Navy Tradesman Group C Admit Card 2019. They need to provide some information for downloading their Indian Navy Entrance Letters such as the Login ID, Birth Date, etc. As we know, the Indian Navy conducted the examination for the profile of Trade Mate. In order to participate in the examination, all of them have to take the Indian Navy Trade Mate Admit Card 2019. This is necessary for all the candidates who sit in the examination hall. Without the Indian Navy’s Trade Mate Call Letter 2019, the Authority will not allow you to enter the Examination Hall. There are some important data about the candidate applied in the call letter and the examination. On the examination day, you will be identified by your Indian Naval Tradesman Admit Card 2019. Therefore, every applicant has to get his Indian Navy Admit Card on the day of the examination. For various posts, downloading the Indian Navy Admit Card 2019 requires visiting the official website. They have to download it manually. Examination based on the necessary qualifications ie Matriculation and ITI. The examination will be of 100 marks. The written examination will be General Intelligence and Reasoning, Numerical Aptitude, General English, General Awareness. The question paper will be in both English and Hindi (excluding general English).